Josh Wludyka (pronounced loo-dyke-ah), winner of the 2016 Bon Vivant Cook-Off, is a man on a mission. 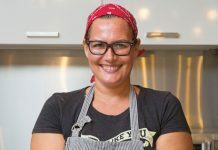 The 26-year-old Detroit native, whose inspired use of local produce infused with a “sense of place,” wowed judges in the hotly contested face-off. As well as using a mix of ingredients, to him great cooking means trying new techniques to extend your culinary repertoire and using produce in different ways while balancing flavors into a harmonious whole. He particularly enjoys cooking breadfruit and okra in different ways, as with a little effort and ingenuity, he says they are wonderfully versatile and packed with flavor. 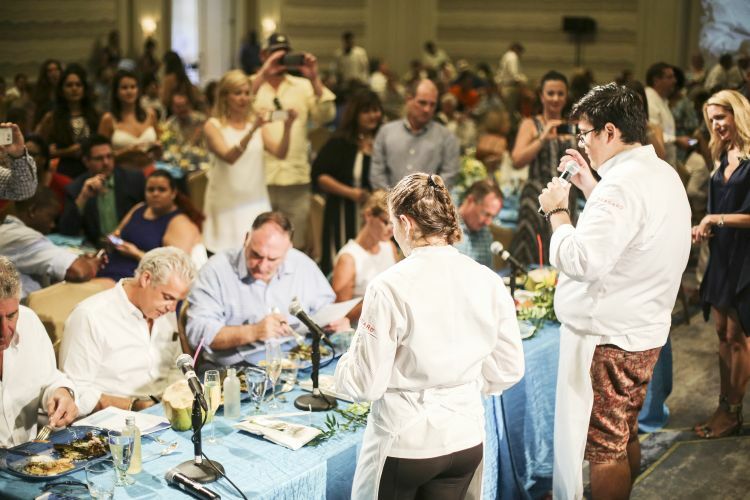 A gifted amateur chef, Josh came through the three rounds of Cayman’s top culinary competition to make off with the grand prize before a capacity audience. 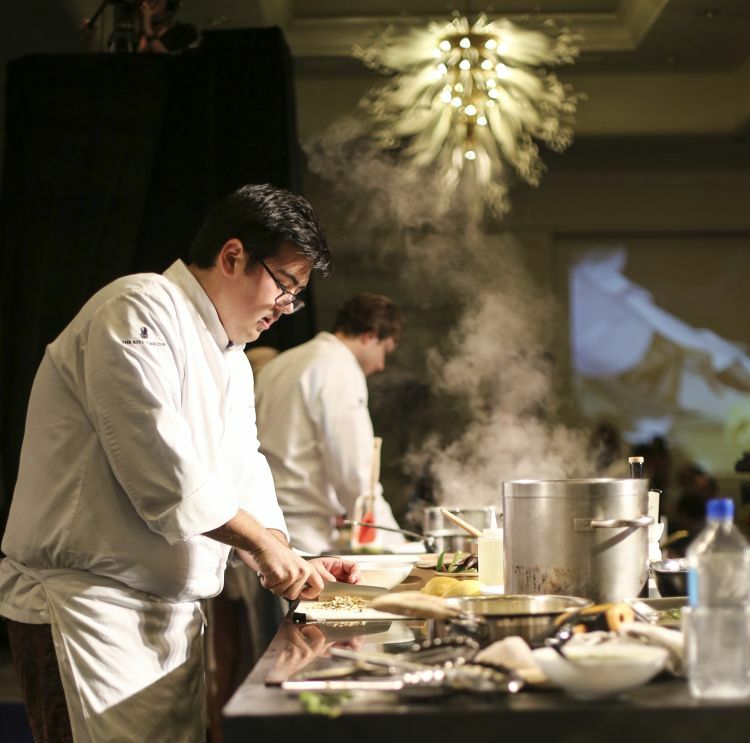 As the winning finalist, he and his sous chef/girlfriend Ashley Stafford recently jetted off to the Food & Wine Best New Chef event in New York, staying at The Ritz-Carlton. Their prize also included lunch at the three Michelin-starred Le Bernardin, whose owner and executive chef is Cook-Off judge Eric Ripert. Growing up in Detroit, Josh, who is of Korean-Polish extraction, ate ethnically diverse foods alongside more American staples. The aromas and fresh ingredients, part of his cultural heritage, ranged from his mother’s home-made kimchi to the warm rye bread with hot cabbage soup made by his Slavic grandfather. Looking back now on those early years, Josh says: “I definitely didn’t appreciate what was right under my nose at the time… and Midwestern cuisine hadn’t really taken shape. Josh’s culinary epiphany came while 4,000 miles away from home. As an 11-year-old exchange student in Lyons for eight weeks, he discovered food culture in France’s culinary capital. Introduced to an array of regional specialties by his host family, Josh’s interest in food was piqued in ways that had an enormous influence on his career. “To be honest, up until then, cheese for me was basically Kraft singles,” he says candidly. Taking more than a passing interest in what passed his lips, food became something of a passion. By his mid-teens Josh, who played baseball and basketball, bonded with his father over weekly feasts, sourcing ingredients in Detroit’s colorful Mexican markets. At college, while classmates bought clothes and downloaded music, Josh collected kitchenware. Finally following his passion, he switched courses from economics and finance to hospitality management. For the third year DePaul University student, the timing couldn’t have been better as the Chicago-based college had just received a multi-million-dollar grant from hotel magnates the Hiltons. In one of the school’s first cohorts of hospitality management majors, Josh’s economics background stood him in good stead when studying the business end of catering management. His new course included interesting industry placements in Switzerland and an unforgettable three-month stint in Paris. Back in Chicago, Josh found that the course opened many doors including access to the Windy City’s top restaurants, chefs, and sommeliers. Another big break was scoring a job at Charlie Trotter’s. The two-Michelin starred restaurant owned and operated by chef Trotter was one of only a few job applications Josh made on Craigslist straight after college. Working with the first chef to have his own cookery show on PBS, Josh also worked on the wine team and finally made his way up to be in charge of the restaurant’s “kitchen table” which served 15 to 20 spontaneous courses nightly to parties of up to six. “I soon discovered that in the industry it’s not all about skills but about your attitude and work ethic,” he explains. “Staff come and go in rapid succession because of the antisocial hours. But on the flip side, if you’re keen and committed you get taught on the job what can’t always be found in books,” he says. Trotter’s was Josh’s second “university” and the master chef became a touchstone and a mentor to him. During his time there he got to work alongside consummate professionals and the restaurant was a favored haunt of some of the world’s best chefs who invariably called in to pay their respects when in town. With the long hours, those who stayed on were soon welcomed as part of the restaurant’s family: eating, laughing, and working together. 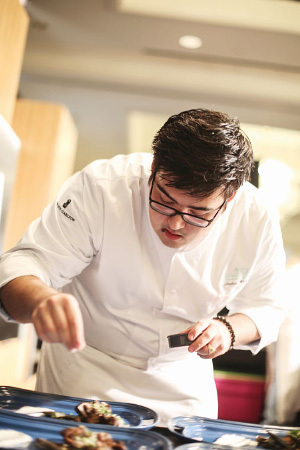 Josh moved to Cayman when Charlie Trotter’s closed, following a chef friend who had relocated to the island. 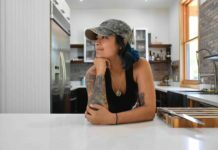 “I was immediately taken with the great lifestyle and food options here and subsequently built up my own home kitchen,” says Josh. 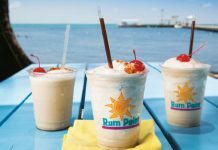 Won over by the island vibe, he wants to see more local restaurants opening, especially ones that will serve well-prepared high-quality island fare. Josh is particularly keen on the variety of flavors found in local greens like arugula, Asian greens and calaloo. His growing appreciation of fruits and vegetables follow from him gradually moving away from heavily meat-based dishes. These days Josh finds produce that is “super natural and more rooted to the earth” more appealing. “Fruit and vegetables are lighter with phenomenal textures and flavors,” he says. “I’m happiest making simple and soulful three-ingredient dishes,” he notes. Getting back to his recent win, Josh says that it is particularly gratifying as he “totally blew it” in 2014. In round one he prepared local rib-eye with charred okra and parsnip purée; a three-ingredient dish which was very simple and pleased the judges. For round two, Josh again plumped for beef, preparing it Korean short ribs style, cut across the bone and thinly pounded out with chorizo salsa and plantain tostones. Having made it to the final he infused his dish with a “sense of place” grounding his ingredient choices in the local environment. The Cook-Off judges which included celebrity chefs Eric Ripert, Anthony Bourdain, and José Andrés were suitably impressed with Josh’s jerk chicken and fried breadfruit with okra and lightly pickled local wing beans. “With Ashley’s help it all came together in the final,” he says, “though the days leading up to the Cook-Off were pretty intense with her practicing endlessly to perfect the breadfruit element. “The other dish was a riff on a Sardinian specialty: bottarga (mullet roe). More involved in the final than in the earlier heats, Ashley sourced wahoo roe from the local fish market and salt cured it to draw out moisture,” says Josh proudly. A team effort, Josh says it was the humble breadfruit’s taste and preparation that helped catapult them into first place. As to the future? Josh plans to open up his own place one day, a dream that working at Agua is helping towards.